Onyx is a type of chalcedony, which is a type of silica mineral. The lattice of chalcedony contains fine veins of quartz and moganite (not to be confused with morganite, a pink gemstone). Onyx can be challenging to identify since it can come in pretty much any color other than blue or purple. Onyx which is neither black nor white will often have bands of black or white along with bands of color. When most people think of onyx, however, they are thinking of the black variety, prized for its luster and simple elegance. List of Gemstone Meanings: For our full list of gemstone meanings. The word ‘onyx’ is derived from the Greek word for ‘claw’ or ‘nail’. The word refers to the flesh-toned variety of onyx, which may resemble a chipped off claw or nail if you find it lying around on the ground. As a hard stone, onyx has been used for carvings and jewelry since ancient times. Some of the earliest examples of onyx carvings are bowls and potteries from the Second Dynasty in Egypt. There are also examples of beautiful onyx artifacts from Minoan Crete. 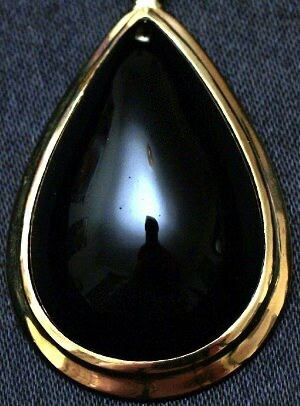 Onyx is also prized in mythology. In the Book of Revelation, the foundation of the city of Heaven is made of onyx. Onyx is also mentioned as being a component in the garments of priests. In recent history, onyx was used by German architect Ludwig Mies van der Rohe to construct a famous iridescent stone wall in the historic Villa Tugendhat in the Czech Republic. The house is considered to be an exemplary icon of modernist architecture. Disclaimer: Black onyx should not be used instead of regular medical treatment, but in addition to treatments. Always seek professional help when dealing with health related problems.